Don Cherry has been a household name for decades. Having coached almost 500 games for the Boston Bruins and the Colorado Rockies, Cherry became the fastest NHL coach to reach 250 wins. 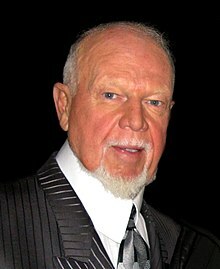 In 1980, Cherry moved over to the broadcast side of hockey, joining Coach’s Corner, and in 1986 he was paired with Ron MacLean – the rest is history. A native of Kingston, Ontario, Don Cherry is one of Canada’s most beloved and memorable broadcasting icons.